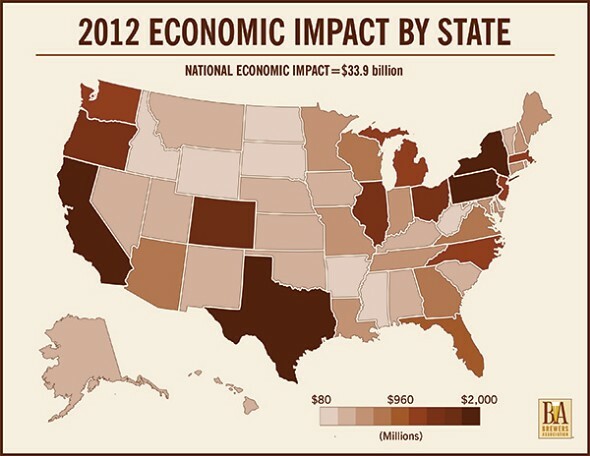 The Brewers Association—the not-for-profit trade association that represents the majority of U.S. breweries—announced today that small and independent American craft brewers contributed $33.9 billion to the U.S. economy in 2012. That figure is derived from the total impact of beer brewed by craft brewers as it moves through the three-tier system (breweries, wholesalers and retailers), as well as all non-beer products that brewpub restaurants sell. During 2012, 2,347 craft breweries operated in the U.S., comprised of 1,132 brewpubs, 1,118 microbreweries and 97 regional craft breweries. These sold a collective 13,235,917 barrels of beer worth an estimated $11.9 billion, all while providing more than 360,000 jobs and with 108,440 jobs directly at breweries and brewpubs, including serving staff at brewpubs. Moral of the story? Continue supporting your local craft breweries! The full report can be found here.